Multi-function, flashlight, blinking, flash strobe. C clamp, high impact, lightweight ABS casing. Weather resistant construction. 2 meter beam distance, uses 2 Lithium button cell CR 1220 coin cells, included. Plastic, 2.75" L x 1.5" W, 1oz. Push button switch. Red/white/blue/orange colors. Sleek design and a simple twist on/off function. Batteries last over 60 hours and can be easily replaced. Waterproof and equipped with a number 0 S-Biner. Waterproof, they float. 4x replaceable AG-3 batteries included. 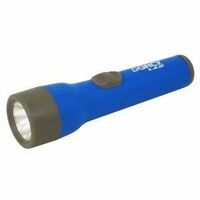 Economy flashlight, anti-roll design, ribbed casing for strength and a non-slip grip. Contoured slide switch. Lifetime white LED never needs replacing. Operates for 40 hours using 1 Eveready super heavy duty D-size battery. 9 lumens with a beam distance of 57 meters. Typical weight of 62 grams without battery. 160mm length x 40mm diameter. Assembled in the USA. Red, blue green and orange colors. Do not specify color. LED deluxe flashlight, side barrel slide switch. 25 lumens, 10 hours, 50 meters beam distance. 6" length x 1" width. Red / blue colors. Uses 2 AA batteries, included. Brackets and mounting screws to hold D size Maglite. Made in the USA. Super tough rubber construction. Water resistant. Uses 1 D cell battery (included). LED bulb never needs replacing. Uses 3 AAA Energizer alkaline batteries, included. Compact to fit in pocket or purse, puts out 8 lumens of light for 60 hours.